The Primary School Leaving Examination (PSLE) is a national examination in Singapore and Botswana administered by the Ministry of Education. 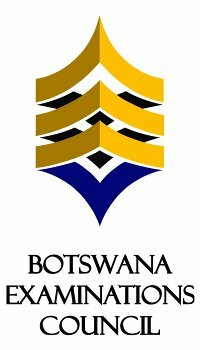 The examination is held once a year (Letter and Composition for English and Setswana in August; all other papers in October). The examination is designed for candidates who have completed seven years of primary education or its equivalent. The Scheme of Examination makes provision for candidates who are studying through informal means, as well as those engaged in full-time education. Candidates must be at least 11 year old when they take the examination, but otherwise there is no age restriction. The Primary School Leaving Examination (PSLE) is conducted in Singapore annually. It is a national examination which pupils sit at the end of their final year of primary school education. 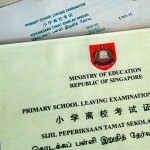 A pupil can sit the PSLE if he/she is studying in an approved institution in Singapore. The format of the PSLE and the presence of it in the Singapore education system gives the PSLE a part in national culture. PSLE material has also been exported to other countries. The Primary School Leaving Examination (PSLE) is a national examination in Singapore. Primary Schools in Singapore having 4-year foundation stage from Primary 1 to 4 and a 2-year orientation stage from Primary 5 to 6. 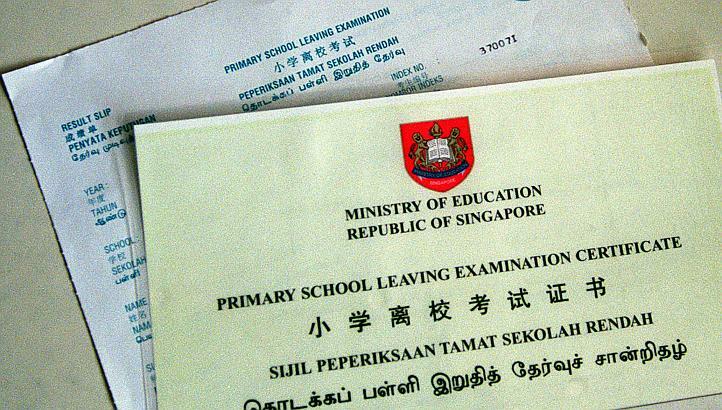 Once students has finished their primary schooling all students need to appeared in Primary School Leaving Examination (PSLE). This exam conducted by Ministry of Education Singapore every year in the month of August.